A true landmark publication, Advances in Fisheries Economics brings together many of the world’s leading fisheries economists to authoritatively cover the many issues facing the field of fisheries economics and management today. Compiled in honour of the work and achievements of Professor Gordon Munro of the University of British Columbia, Canada, this exceptional volume of research serves as both a valuable reference tool and fitting tribute to a man whose work has shaped the discipline. 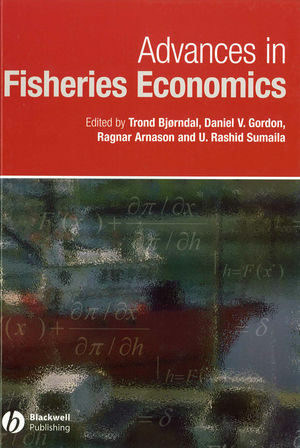 The book is an important addition to the resources of all fisheries economists, managers, scientists and fish biologists. Libraries in universities and research establishments where these subjects are studied and taught should have copies on their shelves. Dr. Trond Bjørndal is Professor of Economics, Centre for Fisheries Economics, Institute for Research in Economics and Business Administration, Bergen, Norway and Director, CEMARE, University of Portsmouth, England. Dr. Ragnar Arnason is Professor of Economics and the Chairman of the Institute of Economic Studies, University of Iceland. Dr. U. Rashid Sumaila is Director of the Fisheries Economics Research Unit, Fisheries Centre, University of British Columbia. Chapter 1: On the Contributions of Professor G.R. Munro to Economics. T. Bjørndal and D.V. Gordon. Section 1. Property rights and fisheries management. Chapter 2: Phases in the Evolution of Property in Sea Fisheries. Chapter 3: Property Rights Quality and Economic Efficiency of Fisheries Management Regimes: Some Basic Results. Chapter 4: How to Resolve the Class II Common Property Problem? The Case of the British Columbia’s Multi-Species Groundfish Trawl Fishery. R.Q. Grafton, H.W. Nelson and B. Turris. Chapter 5: Auctions of IFQs as a Means to Share the Rent. Chapter 6: Shadow Prices for Fishing Quota: Fishing with Econometrics. D. Dupont and D.V. Gordon. Section 2. Capital theory and natural resources. Chapter 7: Rational Expectations and Fisheries Management. Chapter 8: Linking Natural Capital and Physical Capital: A Review of Renewable Resource Investment Models. Chapter 9: Fisheries Management with Stock Uncertainty and Costly Capital Adjustment. M. Doyle, R. Singh and Q. Weninger. Section 3. Game theory and international fisheries. Chapter 10: The Incomplete Information Stochastic Split-Stream Model: An Overview. R. McKelvey, P.V. Golubtsov, G. Cripe and K.A. Miller. Chapter 11: Coalition Games in Fisheries Economics. M. Lindroos, L.G. Kronbak and V. Kaitala. Chapter 12: Incentive Compatibility of Fish-Sharing Agreements. Chapter 13: Fish Stew: Uncertainty, Conflicting Interests and Climate Regime Shifts. Chapter 14: A Dynamic Game on Renewable Natural Resource Exploitation and Markov Perfect Equilibrium. Section 4. Applied fisheries economics and management. Chapter 15: The Role of the Fishing Industry in the Icelandic Economy. S. Agnarson and R. Arnason. Chapter 16: Factor Use and Productivity Change in a Rights-Based Fishery. B.M.H. Sharp and C. Batstone. Chapter 17: Scientific Uncertainty and Fisheries Management. W.E. Schrank and G. Pontecorvo. Chapter 18: Spatial-Temporal Stock Assessment Analysis with Application to the Scotia-Fundy Herring Fishery. Another truly global cooperation, this is an up to the minute review of the latest developments in fisheries economics by thirty of the world's most prominent academic economists whose work focuses on fisheries.